It is often argued that good governance is possible only when governing institutions perform to certain standards and that failures are due to declining capacities and capabilities. Capacity development efforts, even when targeted at institutional strengthening, focus on the individuals that make up the institutions with the hope that they will use acquired skills to develop the institution. Mobilising for Development (M4D) is a six-year programme (2012 – 2018) funded by DFID, and implemented by a Palladium-led consortium, which includes Itad and ICFI. The programme aims to enhance local governance and contributes to improved local service delivery in selected Local Government Areas (LGAs) in three states in Northern Nigeria: Kano, Kaduna and Jigawa. 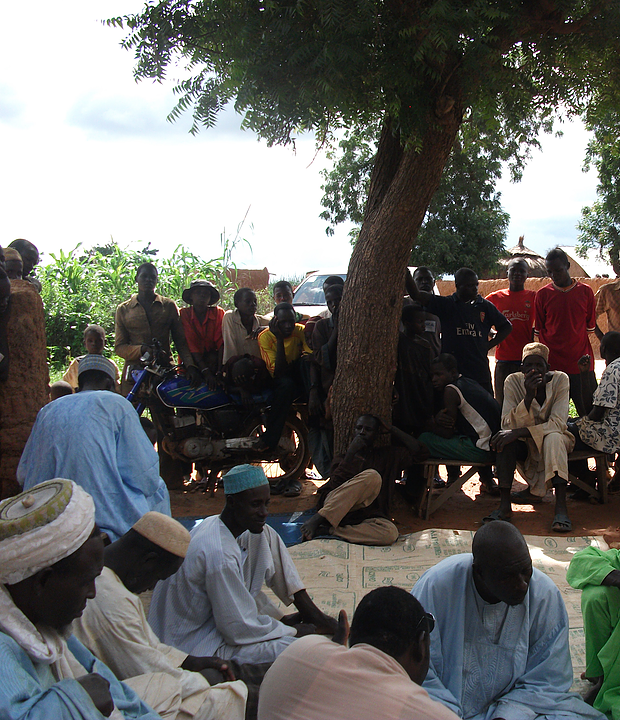 A core approach of M4D is to strengthen the capacity of community-based organisations (CBOs) and platforms of adolescent girls to articulate community-led demands to service providers and policy-makers (PMs), and in turn to strengthen the capacity of PMs and service providers to better respond to these demands and be more accountable. From inception to date, M4D has provided training and mentoring to more than 60 CBOs, including those of people with disabilities (PWDs), close to 10,000 adolescent girls, and more than 600 PMs. The interactions of CBOs and adolescent girls with communities has strengthened the capacity of close to 400,000 community people in articulating and making demands to PMs on improved services. Itad’s role in M4D involves providing oversight and support to demonstrate impacts and results of interventions and evidence thereof. This includes strategic, intellectual, and systematic support to the programme on performance results monitoring, data verification, performance evaluations and organizational learning, as well as M&E capacity building. A particular focus is ensuring that programme results are robust and comprehensive, and in line with the logical framework. Several issues emerge when we look at capacity development, especially in the context of governance or sustainable development. Attributing improvements to the project is challenging. As is often the case with many development projects, measuring the effectiveness of capacity development and attributing these to the observed impacts of the project is a challenge. This is partly because the goals of projects are often expressed as SDG targets or in terms of improved governance or service delivery. The process of change is very often non-linear, with multiple contingent factors. Hence measuring such change and attributing these to a capacity building project or programme is challenging and requires complex measurements at multiple layers. Pathways to change can be long and winding. Now, we know that the pathways from capacity development to SDG targets would necessarily be a fairly ‘long one’ requiring attitude change from new skills acquired, as well as putting these skills into use. Firstly, other factors within the institution or system are needed for capacity development to have an effect. Secondly, the results of capacity building can often take time to manifest and so it can be tricky with donors or partners impatient for results. Evaluators often look at the short term. As development professionals or even evaluators, we often look at the short term, when assessing the positive effects of training. Firstly, many development programmes are not necessarily to scale, as they are demonstration programmes and additional efforts are therefore required to ensure widespread impacts of capacity building. Secondly, staff turnover or movement means skills may be lost. To overcome these challenges the programme has put in place robust systems to capture changesalong processes. For example, there are three-monthly follow up with PMs on how they have ‘implemented’ action plans from training, and how they have used new skills within their institutions. This usually involves a discussion on the extent to which PMs have developed their Service Improvement Action Plans (SIAP) through consultation with citizens, or how such plans have been implemented, including how services have improved as a result. In other instances, the programme documents the processes involved in citizens coming together toprioritise service delivery demands and how these are ‘logged’ with PMs. There is also a process of documenting how PMs eventually respond to these demands. So, with the follow-up assessments involving SIAPs, as well as an analysis of demands generation by citizens, it not only allows results to be documented along the process but also ensures that the programme is able to trace the relationships between capacity building and service improvements. Similarly, our experience with M4D has shown that movement of trained people is not necessarily a negative thing, particularly if the people that have acquired new skills can deploy and apply them in their new postings. Some of the PMs that received capacity strengthening in participatory planning and budgeting have used these skills in their new postings with positive effects! In a study undertaken by M4D, that looked at the impacts of personnel transfers, it was observed that more than three-quarters of the respondents were positive when asked if they are able to apply new skills following redeployment to a non-M4D LGA. In fact, specific instances were noted, where they had already done so. For example, a public servant from Jigawa State said that after he was redeployed, he used the learning from M4D training to identify areas of weakness in (new) LGA procedures and to develop solutions to address them. To wrap up, although measuring the impacts of capacity is challenging and often complex, having systems in place that allow changes to be captured along the continuum is important. This can begin from training to mentoring, and then the resultant behaviour changes; and ultimately how behaviour change translates to the desired improvements in governance or service delivery. In a follow-up blog, I will explore the specific things to consider when assessing the benefits of capacity building. DAC 2006 defines capacity as the ability of people, organisations, and society as a whole, to manage their affairs successfully; and capacity development as the process by which people, organisations and society as a whole create, strengthen and maintain their capacity over time.